Despite the difficult and challenging global economic situation, African countries achieved considerable economic progress in 2015, registering a 3.6% average GDP growth during the year when the best performers in developed countries hardly reached 2%. Africa also accounts for five of the world’s fastest-growing economies with Côte d’Ivoire, Democratic Republic of Congo, Ethiopia, Rwanda and Tanzania registering growth rates of seven percent or more. These are some of the positive stories presented to thousands of participants at the African Development Bank’s Annual Meetings in Lusaka, Zambia, on Wednesday, May 25, 2016 by its Vice-President for Finance, Charles Boamah, and Treasurer, Hassatou N’Sele, who underscored the Bank’s strong financial standing and preparedness to support the regional member countries. However, the much-celebrated growth comes with downside risks such as persistent commodity prices declines, inadequate infrastructure, non-inclusivity and global headwinds which impede growth and underscore the need for diversification. In 2015, economic performance was varied across countries and regions, with Eastern Africa at the top of the group with an average GDP growth of 6.3%, from 6.5% the previous year. Central Africa averaged 3.7% from 6.1% while Western Africa recorded a sharp decline to 3.3% from 6% in 2014. In North Africa, growth more than doubled from 1.4% to 3.5% during the year, while Southern Africa slowed to an average of 2.2% from 2.8% in 2014, making the region the slowest growth pole in the continent during the year in review. According to the presentation, these figures challenge the notion that Africa’s phenomenal growth in recent years were essentially derived from the commodities boom. In East Africa, for example, growth was weighed down by instability and political crisis in Burundi and South Sudan, while the slump in West Africa was the direct effects of depressed commodity prices, the Boko Haram phenomenon and the Ebola epidemic. In the Central African region, the decline in oil and metal prices were the main causes just as the acute shortages of power, climate change and low commodity prices negatively impacted growth in the Southern Africa region. Africa’s resilience at a time when frontline global economies were struggling can be attributed to strong public investment especially in infrastructure, strong domestic consumer base, a burgeoning services sector and gradual economic diversification. The report projected the continent’s average GDP growth to 3.7% and 4.5%, respectively, in 2016 and 2017. 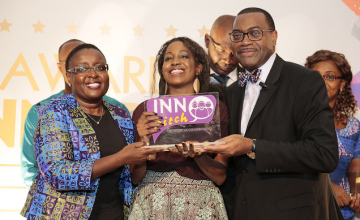 During his dialogue with the African Development Bank (AfDB)'s Governors in June, AfDB president Akinwumi Adesina announced that the Bank was "retooling" itself. "We are hiring top notch staff... We are trying to get the sharpest minds that we can get to the bank so that we can deliver on the High 5s" Fulfilling that promise, AfDB recently announced a series of new appointments. More about the AfDB in this BRIEFING. The Bank Group, which caters to the development needs of the 54 Regional Member Countries, equally made significant progress in 2015, registering a 25.4% increase in its operations, with total investments of USD 8.8 billion in projects and programmes during the year. As in the previous years, and in line with the Bank Group’s Ten Year Strategy, the huge chunk of these investments were devoted to infrastructure operations (mainly transport and energy). According to the report, the Bank is more than ever fit for purpose to accelerate the continent’s development with its High 5 priorities designed to leverage the Ten Year Strategy in the five domains considered to be critical to the continent’s growth and development: Light up and power Africa; Feed Africa; Industrialize Africa; Integrate Africa; and Improve the quality of life for the people of Africa. In energy, the topmost priority that is likened to blood in the human body, the AfDB plans to invest USD 12 billion and leverage about USD 50 billion over five years to light up and power Africa in 10 years. It will quadruple resources to agriculture, which will henceforth be treated as a lucrative business; from a current annual average of USD 612 million to about USD 2.4 billion. The annual investment in industrialization is estimated at USD 5.6 billion; while some USD 3.5 billion per year will be devoted to the development of high quality infrastructure from 2016. Boamah and N’sele were quick to cite some of the Bank’s emblematic realizations as proof of is capability and readiness to give Africa the push it requires for transformation. These include a USD 142.7-million Bamako-San Pedro Corridor, which serves as a transit port for neighbouring countries; the USD 42.4-million Africa Backbone Project which supports the diversification of Cameroon’s economy and well as promotes regional integration by enabling neighbouring countries to access fiber-optic infrastructure; as well as the USD 300-million Nacala Rail and Port project, which links Mozambique with Malawi and other countries in the region thereby helping to improve global competitiveness of the region’s mineral, agricultural and manufacturing exports. Copyright © 2016 African Development Bank. All rights reserved. Distributed by AllAfrica Global Media (allAfrica.com). To contact the copyright holder directly for corrections — or for permission to republish or make other authorized use of this material, click here.